TEHRAN, August 22 - Israel has been terrorising Palestinians in Umm al-Hiran in an effort to accelerate demolition plans, residents say. TEHRAN, Young Journalists Club (YJC) - In the Bedouin village of Umm al-Hiran, residents say the closing of an investigation into the killing of Yacoub Abu al-Qiyan is evidence of a wider strategy to drive residents out of the rural community. Israeli forces fatally shot Yacoub, a 50-year-old Palestinian citizen of Israel, in January during a pre-dawn raid to bulldoze his home. The demolition was part of the state's plan to raze Umm al-Hiran, transfer its residents elsewhere and build in its place a new town, which Palestinians believe is being designed exclusively for Israeli Jews. Last week, Israeli media reported that police had ended their investigation into Yacoub's case without laying charges. Israeli police have not made a formal announcement and did not respond to Al Jazeera's request for comment on the matter. The news has incensed local residents, who cite a broader pattern of police impunity for the killings of Palestinians - but they remain resolute in their opposition to the state's plans for Umm al-Hiran. "We absolutely refuse to be transferred," Raed Abu al-Qiyan, the village's 40-year-old leader and Yacoub's nephew, told Al Jazeera. According to a 2015 Supreme Court order, which asserted that the land belongs to the state, the state is permitted to forcibly transfer residents of the village. The decision urged the state to provide residents with alternatives, but did not obligate it to do so. The state has since offered to move the village's 450 residents temporarily to neighbouring Hura, 8km south of Umm al-Hiran. Although the village's residents do not approve of the proposed offer, legally, their refusal cannot stop the eviction process. A 1956 military order displaced residents of the town from their original village of Khirbet Zubaleh and required them to relocate to Umm al-Hiran. The order also applied to numerous other Bedouin communities. According to Maysanna Morany, a lawyer at Adalah, the Legal Center for Arab Minority Rights in Israel, several governments in the years to follow refused to recognise the village, denying it access to advanced infrastructure and rendering it, along with dozens other villages in the Negev, as illegal. Residents of the village, who have inhabited the land for 61 years, were never granted legal ownership of the area. In 2003, the state rendered them "trespassers", triggering a legal battle. The high court's 2015 ruling stipulated that the residents were not, in fact, trespassers, but had no legal ownership of the land. 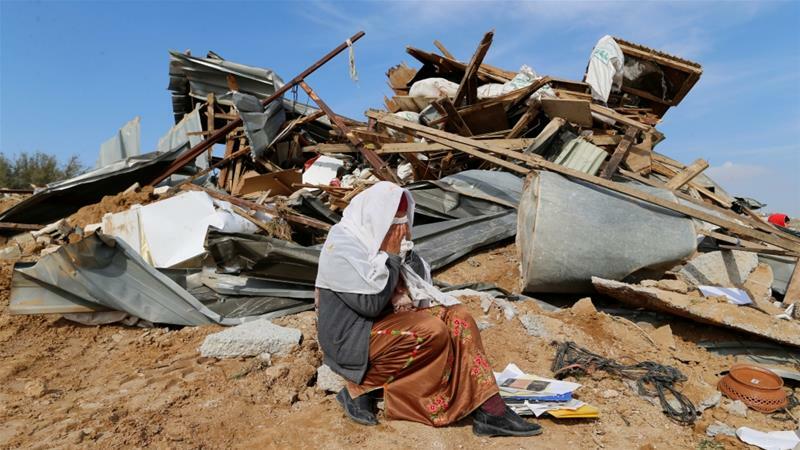 Israeli authorities regularly carry out demolition orders in the Negev on the basis that these villages lack building permits, but residents say it is impossible to obtain a permit to build legally. Umm al-Hiran and some 40 other "unrecognised" Bedouin villages in southern Israel consequently live under an existential threat. To date, at least 11 out of 36 villages are officially planned to be demolished and replaced with Israeli towns, according to a statement from the Umm al-Hiran council on Thursday. Raed said that construction on the new town in his area began more than two years ago, and to date, at least two of the village's 150 homes have been destroyed. Israel's National Planning and Building Council has told villagers that their transfer to Hura would be for a period of seven years, after which "solutions can be found or discussed", he said. "We want to be an Arab agricultural village; we don't want to be shoved in an urban residential area." Over the past two weeks, Raed said Israeli police arrested four village residents for allegedly "inciting violence" - an accusation he describes as false. The arrests, he said, are tactics used by Israeli authorities to pressure and "terrorise" residents into accepting a transfer. According to Raed, Israeli police are currently pursuing several other residents in the village, calling for their immediate arrest. The new town being built in place of Umm al-Hiran, which would be called Hiran, would house only Orthodox Jews, according to a clause in a set of bylaws issued by the Hiran Cooperative Association and obtained by Adalah. The association, a legally authorised residents' committee, has the power to market state lands and to determine prerequisites for residency in the new town. Adalah lawyer Suhad Bishara, who represents the residents of Umm al-Hiran, told Al Jazeera that the bylaws could be challenged in court. "Our legal position is that this, of course, violates equality ... Such bylaws cannot be valid legally because of the racist, discriminatory nature of it against whomever is not Jewish in Israel," she said. According to Israeli law, Morany said, an admissions committee's requirements for residence cannot discriminate based on "religion, race or nationality", rendering the Hiran council's requirements as "unlawful". Prior to the Supreme Court's 2015 ruling, residents of Umm al-Hiran had been fighting a legal battle against their eviction for 13 years. In a letter sent to Israeli Attorney General Avichai Mandelblit earlier this month, Adalah requested that he "take actions to ensure that Umm al-Hiran residents - who have been there for the past 60 years - are included in the master planning of the new town, are not forcefully transferred, and are offered a solution without eviction", Bishara said. Adalah is now waiting for a response from the attorney general, a process they say could take months. The responses would determine how Adalah would tackle the legality of the bylaws in court. "We call for a halt to the incitement against the Arab population of the Negev," Raed said. "We want to live in a country that respects and acknowledge all of our demands, and to respect our desired way of life."